The unique challenge for this project will be getting a working system fully designed and tested under 30 days, we completed research on the various approaches and made a decision to move forward with mobile applications for Android and iOS Devices. A few days ago we ran some preliminary stress and accuracy tests on the Android prototype and it went extremely well. We did our testing on a Samsung GT-L9100 and were able to get between 5 and 50 meter accuracy, in addition to providing a 1 to 35 second latency on the runners position. The screenshot above is from a mapping of the data points during testing. We also had a major breakthrough in our Holographic research, the initial prototype can create an 8" x 8" 2D hologram. This has been extremely exciting for everyone involved, were hoping to start heavy experimentation on the prototype and see if we can produce a full 3D hologram. The video below gives a quick demonstration of the holo-emitter assembly in action, since the produced output is two dimensional we opted to use a digital three dimensional animation. The results were pretty awesome! 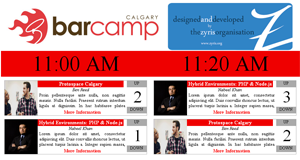 If that wasn't exciting enough, we are also working with Bar Camp Calgary to put together a voting interface for their unconference event on May 5th. For those not familar with an unconference, its a an emerging trend that started in the Open Source community, essentially its like any old conference with one major change. In traditional conferences, speakers are picked, and scheduled weeks or even months in advance, attendees come prepared to hear talks on specific topics. Topics for an unconference are decided upon the morning of the events, with the decisions made by all the attended, but the best part is that anyone can be a speaker. If your topic is interesting enough you could get voted into a time slot and be presenting. Currently this is done with sticky notes on a large grid, attendees vote by placing a line using the 5 line counting method. We will be designing and developing a solution that utilizes touch technology to not only give organizers an easier way to schedule the speakers but to provide attendees with more information on the contents of presentations. Like the marathon project, we have a very limited development window, just under 5 days remaining. This is defiantly going to be a great busy week for all of us here!